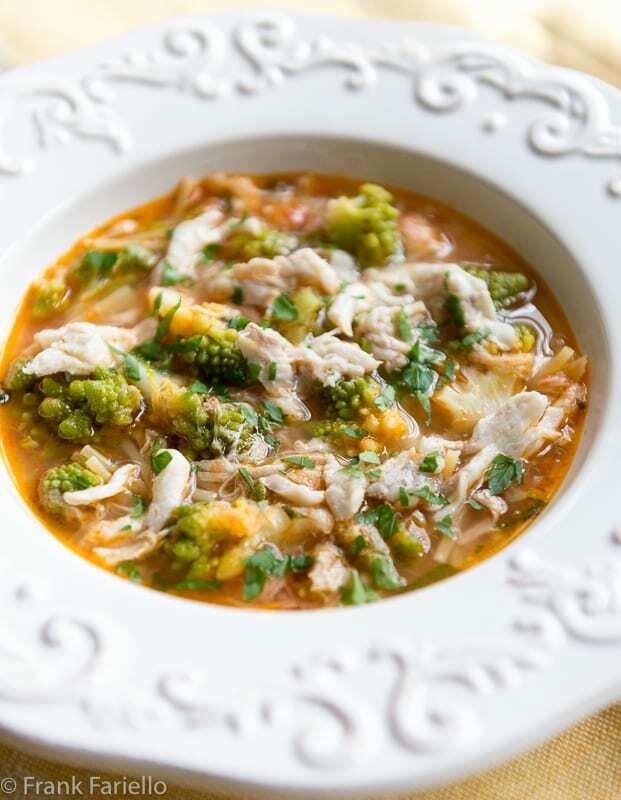 Like many Roman classics, this humble soup is quite simple to make: you start with a broth made from the skate, which is added to the Romanesco broccoli which you’ve begun to sauté with a tomato-tinged soffritto. Everything simmers together until the broccoli is tender, then pasta is added to the pot and the simmering continues until it, too, is tender. The skate is shredded and added to the soup. It’s a unusual, even seemingly odd, combination of flavors, but it does work, and works very well. Minestra di broccoli e arzilla makes a nice primo, or first course, for a traditional Christmas Eve fish dinner. Simmer the skate with the aromatics in enough water to cover everything well for about 30 minutes. When the skate is the cooked remove it, drain it, set it on a cutting board and shred it, taking care to remove any bits of cartilage. Strain and reserve the broth, discarding the aromatics. Meanwhile, in a separate pot, gently sauté the garlic, parsley and anchovy in olive oil until the garlic is just beginning to slightly brown and give off its aroma. Add the tomatoes, crushing them between your fingers as you drop them into the pot. Let simmer until the tomatoes have melted into a saucy consistency. Add the Romanesco flowerets to the pot, mix them gingerly so they’re covered with the tomato sauce. Let everything simmer together for a few minutes, then add the strained skate broth to the pot, topping up with water if needed. Continue simmering for a few minutes more, until the flowerets are nearly tender and you have a rich tasting broth. Taste and adjust for seasoning. Serve immediately. If you like, reserve a bit of the skate for garnish, along with a sprinkling of minced parsley. A drizzle of best quality of olive oil wouldn’t be amiss. This light but flavorful soup is made from two rather unusual ingredients: The first is skate, a flat bodied, cartilaginous fish with large “wings” called arzilla in Roman dialect and razza in standard Italian. It was once thought of as a ‘garbage fish’ but now quite trendy—you could think of it as the quinto quarto of seafood. Instead of ingredients given here, the soffritto also could be the usual ‘holy trinity’ of onion, celery and carrot. It would likely give you a milder flavor profile, if you like that. Personally, I don’t care for the sweetness of carrots in fish dishes. Instead of adding the shredded skate to the soup itself, some people reserve the skate as second course, dressed with lemon, parsley and olive in the manner of baccalà lesso. Whether you want to is up to you, and the quality of the skate. Simmer the skate with the aromatics in enough water to cover everything well for about 30 minutes. When the skate is the cooked remove it, drain it, set it on a cutting board and shred it. Strain and reserve the broth, discarding the aromatics. Add the Romanesco flowerets to the pot, mix them gingerly so they're covered with the tomato sauce. Let everything simmer together for a few minutes, then add the strained skate broth to the pot. Continue simmering for a few minutes more, until the flowerets are nearly tender and you have a rich tasting broth. Taste and adjust for seasoning. Serve immediately. If you like, reserve a bit of the skate for garnish, along with a sprinkling of minced parsley. A drizzle of best quality of olive oil wouldn't be amiss. Hi Frank. Well, we just got back from our trip to Rome and I definitely did not see this dish anywhere… There are many “famous” dishes that you often don’t see in restaurants, like Pasta e Ceci for example. It’s the perfect season for it but that was nowhere to be seen either. Bizarre. I usually prefer simple Trattorie and I would think that they would serve dishes like this but maybe they think the tourists won’t eat them? Stracciatella alla Romana is hardly ever on menus either. Oh well. At least we’re lucky enough to enjoy cooking so can prepare them ourselves! Did you check out “da Roberto e Loretta”? They claim to serve it—apparently one of the few places in town that does. I absolutely adore skate, I imagine this is a delicious and heart warming soup. I have never heard of this soup and I don’t think we get skate here in Northern Australia. But it does look like a deliciously hearty soup. I love the addition of anchovy! Thanks, Marcellina! If you can’t find skate, you might try a similar white-fleshed fish like cod. Broccolo Romano so bad to try it. It’s delicious. I’ll try your recipe next time. It looks great. Do you think they don’t serve it much in restaurants because it’s too humble? I’m going to Rome next weekend and will look for it. Tis the season for Broccolo Romano so maybe… Thanks for sharing so many authentic, wonderful recipes. Yes, this is one of those “old timey” dishes that is mostly made at home. Although I would think you could find it in a really authentic trattoria that specializes in cucina romanesca. I’d be curious to know if you can find it on your trip. Do ask about it and see what they say. By the way, did a quick Google search and I found this place that serves it, called, “da Roberto e Loretta” on via Saturnia. Might be worth a try! I’m afraid that skate is one thing we never find here in Tucson! I would love to try that someday, Frank – perhaps I’ll have to visit friends on the East Coast so that I can visit their fishmonger! It’s actually not easy to find around here, either, for whatever reason. Only a few places carry it. You could try this with another white fish that’s not so hard to find, like cod for instance. Not quite the same, but it’ll be tasty all the same. I love romanesco, not only does it look a bit E.T. (which might encourage some children to try it) but the texture is very pleasant. If I do a Christmastime meal at all, it will definitely be magro – while I love food, my system doesn’t tolerate “groaning boards” any more. I haven’t been to Rome for at least ten years now; that must be remedied. I am very fond of crisp Portuguese white wines, too. They remind me a lot of the table wines you’d get in Rome. And as you say, the prices are exceptionally low. An update on Hubby getting stingrays in the Florida area. The fishermen usually throw them back or use them for shark bait. But I hear that the variety of skate that they catch around the California area is a better eating type. I certainly wanted to try the recipe! Interesting. I wonder if it’s the quality of the fish or just the lack of demand that makes them throw the skate back into the water in Florida… As mentioned in the post, skate was often thought of as “garbage fish” in the past. But anyway, it’s a dish worth trying for sure. And if you can’t find skate, then another white fish like cod would do. We recently saw this strange broccoli in the super market and now we have the perfect recipe to try it out! :) Thank you Frank! The only problem is getting some skate, since you only found these fresh in few fishmongers and only occasionally. But skate does taste fantastic, doesn’t it? Skate’s hard to find over here, too… But I agree, it’s a fantastic fish. I’d love to try a bowl of this soup (with which I must admit I am not familiar). I love Romanesco broccoli and am glad it’s now fairly easy to find here. Happy Holiday! I hope I can one day find both these ingredients at the same time, Frank! The broccoli is pretty easy, but. I have never seen skate in Tucson! Wishing you the best for a merry Christmas! Skate can be tricky to find in this area here, too, David. We have a great fishmonger right in town, one of the very few places close by that carry it regularly. When I went to buy it, the couple in front of me bought the very last pieces. Argh! But luckily I found it elsewhere in time to post this recipe. Your soup is a new one on me, Frank, although I’ve cooked skate wings and broccoli romano – never together though. You are always so great at informing your readers about traditional Italian recipes. Buon Natale. Buon Natale anche a te, Linda! Frank, I have never come across this particular soup but skate being a favorite fish of mine I must try it. We are having a quite dinner on Christmas Eve and this definitely fits the bill. Buon Natale. Fantastic, Paula! I can imagine Christmas Eve dinner at yours must be quite the feast. Frank…all I can tell you is that Joe had this soup at Armando al Pantheon last year and loved it…which is a very good recommendation for making the soup! 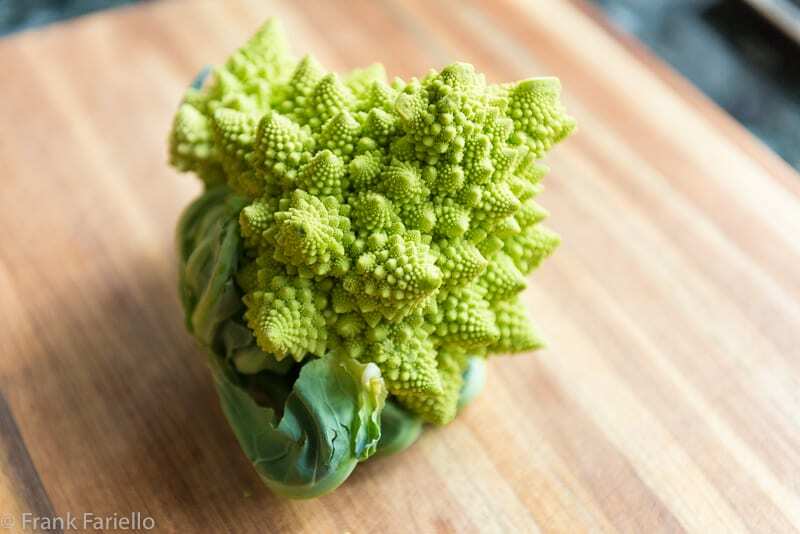 I adore the Romanesco broccolo…just the look is enough for me! This is perfect and then just a touch of the red pepper. I have to do a traditional Midwest Christmas Eve but this will be a lovely way to ring in the New Year. Lovely dish! I’ve had skate before in restaurants, but never cooked with it. It’s got a subtle flavor — kinda sorta like scallops. And I’ve had scallops and regular broccoli combined before, so I know how good that combo can be. You’re right — this is perfect for Christmas Eve. Speaking of which, Happy Holidays! Happy Holidays to you, too, John! Frank, this is a beautiful soup. I’ve never heard of it but it sounds wonderfully appetizing! Thanks, Mimi. Definitely worth a try. Thanks for stopping by! I saw the romannesco broccoli when I was in Rom but don’t think I ever ate it. I have to ask my fish monger if we have Skate. The soup looks wonderful. Happy Holidays ! What an interesting recipe. I’ll have to look up if the skate the Romans use is the same skate that hubby finds at the end of his fishing line and throws back. If it’s the same – I’ve found a use for it. We love our fish and mamma would always make brodetto with it. Papà would take his homemade bread and dunk it. Grazie per la ricetta. If that skate looks a bit like a stringray, then it probably is the same… Enjoy! … excellent recipe. I make it in the same manner, using broken bucatini instead of spaghetti. ps Frank: 10 yrs in Rome!! have u been there lately? have u found it changed…my Italian friends (Romans, actually) tell me that Rome is getting worse and that Milan is getting much better (after the EXPO) , which, you will understand, is really something to admit! Sadly it’s been quite a few years since I’ve been back to Rome, but I plan to fix that next year… And yes, I have heard things have deteriorated since I left, but Romans have always managed to muddle through beautifully.